Evan and I recently read The Twits together. When I put it back on the shelf after we finished, I realized I own a copy of Charlie and the Chocolate Factory but had never actually read it. Also, I had a paper to write, so of course I sat down to read it immediately. If you’ve never heard of it (! ), Charlie and the Chocolate Factory is about a boy named Charlie Bucket who lives near the famous Willy Wonka chocolate factory. One day, Mr. Wonka announces that 5 children will be allowed to come tour the factory and receive a lifetime supply of chocolate – the lucky children will be those who find the golden tickets Mr. Wonka has hidden inside candy bar wrappers. Charlie, of course, ends up being one of the lucky 5. I’m going to assume that you’ve heard of Roald Dahl, at least enough to be familiar with the sorts of books he wrote. I loved the first third of the book. The description of Charlie and his family falling deeper into poverty was really well done, and made me feel desperate! It was just the right amount of seriousness for a children’s book – I was glad it neither crossed the line into “too heavy” nor treated the situation too lightly. Unfortunately, I spent the rest of the book feeling lectured. Who wants that? From a children’s book? If you’ve read the book or seen either version of the movie, you know that Mr. Wonka wants to pass on his factory (spoiler! Sorry!) to the least obnoxious of the 5 kids. So the terrible habits of 4 kids are highlighted: gluttony, being spoiled, chewing gum, and watching TV. I wouldn’t say I have problems in any of those areas – but nonetheless, I felt chastised and reprimanded. Maybe Mr. Wonka went too far; a piece of gum every once in a while is probably fine, right? And watching a little TV should be okay. 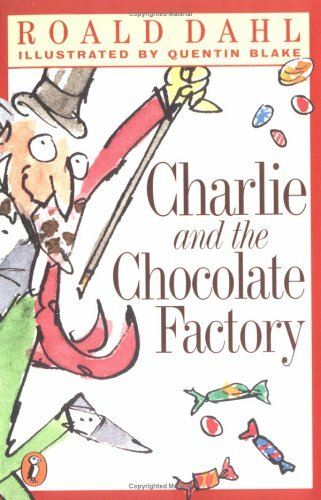 I’d choose other Dahl books over this, notably The Twits and Matilda, but Charlie and the Chocolate Factory is a classic, so you might read it on those grounds. Or you might not. P.S. I know it’s okay to disagree on things, but Jarom doesn’t like the Quentin Blake illustrations. GASP!